Hey, I won an award! | Turning my world upside down! Thank you so much Jessica of The Turquoise Compass for awarding me The Inventive Blogger Award! I recently discovered Jessica’s blog after she visited my blog posts of Antigua. Jessica is a teacher and traveler, like me, so we have much in common. We also seem to share a great love of beautiful beaches and turquoise waters. As a matter of fact, she’s inspired me to make a list of my favourite ocean/beach experiences. Look for that soon. “This is a new award, no one else has the badge on their blog, so it’s EXCLUSIVE to DonCharisma.org. The idea was given to me by paulettemotzko, it’s adapted slightly, there are only five answers now needed to accept the award. The badge is new, it’s not available anywhere else, so get it whilst it’s hot 🙂 The “lego” bridge is a real bridge in Germany, check out the link at the end of the post. The bloggers that I’ve nominated are all memorable to me for one reason or another. They are very inspiring and positive people, whom I’m very proud to call friends, or as close to friends as it gets on WordPress. All of them are inventors in their own ways. If you don’t accept Awards then please pass on to someone else who may like it or just know it’s the thought that counts”. 1. 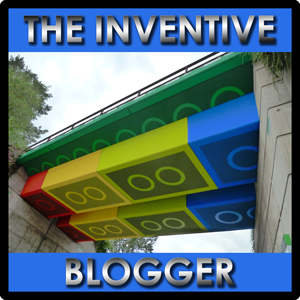 Select the blog(s) you think deserve the The Inventive Blogger Award. 5. Come over and say hello to the originator of the “The Inventive Blogger Award” via this link. 1. I have a place to record experiences, ideas and dreams. 2. I’ve met some great bloggers and shared ideas with them. 3. Reading other blogs is like creating your own online periodical with just topics you really want to read about. 4. I love the comments I get. It makes me feel valued for my insights and experiences. 5. My friends and family keep connected with me when I am away for long trips. Let’s face it, they all want to know how your trip was, but no one wants to sit through a long slide show of your vacation photos when you return. Blogging gets around all that. These are some of the blogs I follow faithfully. They appeal to my different interests, whether it be travel, fashion or education. Since starting my blog in 2010, I’ve learned how to improve my writing, readership and hopefully the appearance of my blog. The inspiration for those improvements have often been from the blogs I’ve read. But this particular list is simply about subjects I find entertaining. I hope you’ll find some blogs you want to follow too from my list. C’est la vie! – following her dream to live and teach in France. Thank you so much! Happy clicking, liking, sharing, and commenting! Pass it on.